The orange Phreesia Pads operate like any tablet, allowing direct input of a patient's information into their medical record with no staff intervention. Patient portals were forced on medical practices about five years ago as part of the healthcare transition from paper charts to electronic medical records (EMR). The portals serve as secure, direct email between patients and their doctors' offices. Unlike standard email, the portal's security allows physicians to freely discuss a patient's diagnosis, answer questions, send lab results, and--if their office uses a web-based EMR--lets the doctor safely access the portal from any device anywhere. Initially, patients and practices alike shunned patient portals. The tech seemed to be a cold, and confusing way to interact about medical situations. But with the public gaining familiarity with electronic, screen-oriented customer service, patient portals looked more appealing. "Once patients realized doctors do respond quickly through the portal, they were receptive," Barnett says. Like with email, a doctor's response is rarely immediate. But because doctors can sign in to the portal from anywhere at any time, patients do see responses on their computers or phones appear outside the expected office hours. "Physicians no longer have to come into the office to send a reply to a patient's query," Barnett says. Kiosks allow patients to bypass the check-in counter for many types of appointments, including submitting copays. On Sundays--the only day the practice is closed--an operator accesses the portal to handle an array of messages, including those that might require an appointment, such as a refill request that first requires a doctor visit. In those cases, the operator sets up appointments and alerts the patient to the suggested appointment time, all through the portal. "We can be proactive with the portal," Barnett says. "We can make patients feel like we are always here for them, as opposed to 10 years ago, when they had to call us after 9:00 a.m. and before 5:00 p.m. on weekdays." With the use of the tech over the last 18 months, phone calls have dropped by 62 percent--from over 800 to around 300 per day. "That, in large part, is because the portal cuts down on repeat calls," Barnett says. Patients who left voicemails in the past would call back until they heard from a doctor. "With the portal, we can respond that we heard you and the doctor will get back to you." Barnett credits their physicians with driving patients to use the portal. "75 percent of our large Medicare population now use it. It's their primary method of communication with us," he says. In the waiting room, technology continues to boost efficiency and savings. BIMA utilizes tablets to check in patients and gather new patient information. The 18 bright orange tablets are hard to misplace or walk out with, and they connect directly to the EMR. "No more paper forms to scan in. It all digitally integrates into our EMR immediately," Barnett says. Currently 60 percent of the estimated 1,000 patients seen each week use the tablet. Patients can also bypass the tablets by completing any pre-visit forms online through the patient portal. Those patients become eligible to use any of the three check-in kiosks welcoming them as they enter the waiting room. "One in three patients walk in during the day needing to only sign in to say 'I'm here'," Barnett says. The kiosks fill that role. Kiosks serve an even more practical purpose at Andrews Sports Medicine & Orthopedic Center. "Standing up and sitting down for orthopedic patients is often difficult," says CEO Lisa Warren. "To bring a clipboard up and down to the front desk is a mess for these patients." 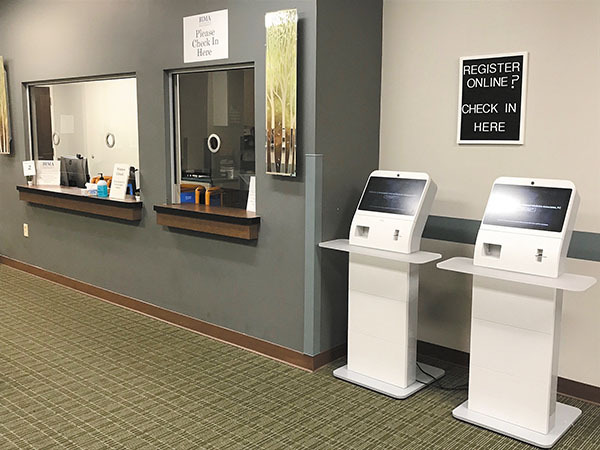 At their check-in kiosks, patients enter their date of birth, and they scan in their insurance card and their driver's license. The kiosk then verifies their insurance and, using their finger on the screen, patients can sign forms, if needed. "They can even pay their copay using a credit card," Warren says. "It's such a better experience for a lot of our patients who struggle with their mobility." 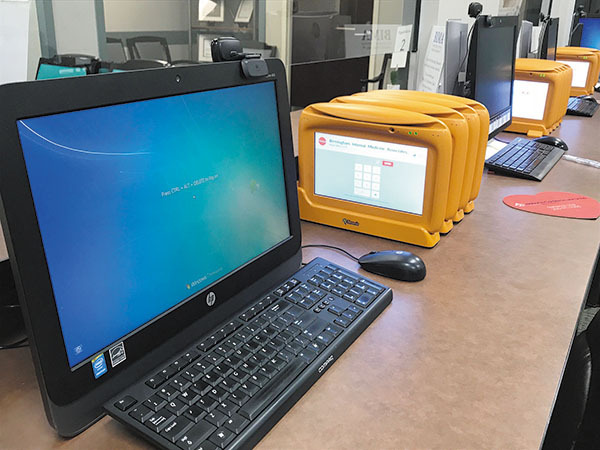 "We're saving a whole lot of effort and data entry with these devices," Barnett says. "We should need double our front desk staff. But because of the tech, we now only have to handle patients who are not tech savvy." For those reluctant tech users, front desk personnel take them into a private area and go through the tablet questions, continuously showing them the screen. "After we start, they may say, 'If that's all it is, I can do that'," Barnett says, admitting that some patients prefer staff to handle the tablet for them every time. "But our patients are our guests, and we have time to devote to being more personable because of the time saved with technology." The kiosks are only a month old at BIMA. Initially only three percent of patients eligible to use the tech bothered, but that number more than tripled over the next three weeks. "We don't want to take away the personal side or have patients feel like they're part of an assembly line. Or, on the other hand, we don't want to slow down folks who want to get in, see a doctor and get out," Barnett says. "We try to meet patients where they are comfortable, offering different styles of communication for what they see as helpful."